Handi Maids servicing the Markham, Stouffville area for over 17 years. Looking for a Maid Service in the Markham area – look no further! Let Handi Maids be your choice for residential house cleaning or commercial office cleaning, with supervised staff, providing our clients top notch quality service. Word of mouth is the largest generator of new business for us at Handi Maids. We value the relationships we have with our satisfied clients in the Markham area. Offering a variety of flexible cleanings to fit your family’s needs. 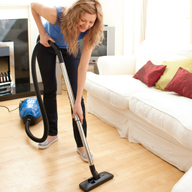 We have reoccurring cleaning- weekly, biweekly, every 3 weeks, monthly. Having unexpected company and need a once over – give us a call for a one time clean. Moving? Let us assist you. Handi Maids usually works in groups of 2 and we provide all equipment and supplies! Trying to balance family, home, and employment is very stressful. Out the door every morning for hours travelling Highway 7, Don Valley Parkway, 404, 401 then laundry, social commitments, kids dance, soccer, and so on… Let us help you so you can relax and possibly read a book at the end of your hectic day! These are reasons that Handi Maids house cleaning has become an important “time management tool”, delegate the responsibility of your meticulously clean and healthy home environment to dedicated, experienced professionals. We will always try our best to provide quality service at a fair price. House cleaning is no longer a luxury. Imagine your whole house cleaned and you didn’t lift a finger. Receiving an estimate is as easy as filling out a web submission or giving us a quick call 1-877-552-6243 or 905-252-6243! Already have a service? Looking for a change? Give us a call to discuss pricing and new possibilities!